Haunted Arizona, a huge list of ghostly locations! Welcome to the haunted hovels section of haunted Arizona. Please select a link below to view information on that location. Arizona official became a US state on the 14th of February, 1912. The first occupants of the state were native Americans who arrived between 16000BC and 10000BC but Europeans didn't visit the land until 1539. As for violence in this state, there was the Mexican-American war which ended in 1848, as well as being the site of some hostilities between Indians and battles during the American civil war, once again plenty has happened within this state for a solid base of the creation of ghosts, and is said to be covered in Indian burial grounds, which is one of the most commonly known causes of hauntings as believed by many. Please select a location from the list below, but remember, new locations will be added so please check back if you cant see what your after. In 1986, a couple in the desert were camping when they saw the ghosts of Indians riding horses, and shooting arrows at them. Every year there has been a man seen holding a lantern, trying to hitchhike to Phoenix. It has been reported that this man was killed when a car ran him over. Also apparitions of animals such as deer have been witnessed here. Built in 1931, this Art Deco masterpiece is reported to be the home of many ghosts. The top floor houses the old Cochise County Jail, where heavy energies and smells can often be sensed. The Division 2 Judge's chambers is often the site of strange occurrences and the fleeting scent of cigar smoke. Security Officers opening the building early in the mornings, have reported hearing voices, slamming doors and seeing the apparently headless apparition in a Judge's Robe, floating through the 2nd floor lobby. This apparition is believed to possibly be the spirit of Judge John Wilson Ross, who served on the bench from 1931 to 1943. Numerous reports of paranormal events have been recorded throughout the rest of the building, mostly by the employees who work daily in this building. The hotel is said to be haunted by a dark, figure-less apparition. She has been seen wandering the halls of the 3rd floor. This restaurant has an interesting history. Originally a house, it was turned into a 7-11 convenience store, and then into Manuel's. The ghost of the original house owner, an old woman, and a murdered clerk from the 7-11 are said to haunt the restaurant. There are reports of a ghostly man that wanders around the store after dark. Many night stockers have reported seeing him in the toy section, his identity is unknown. This is one of the oldest schools in Arizona, going back before Arizona became a state. The oldest building still standing is called "Old Main". A few of the custodians and teachers who have been at the school for many years, or have long since retired, tell of sightings and voices on the second floor of Old Main’s north wing. In fact, one custodian, after experiencing a particularly frightful event, refused to clean that area of the building ever again. It is said that on certain nights, you can see Mr. Hovis sitting on top of his wife's grave, holding the shotgun that he murdered her with. Also, the wooden bridge to get there is said to be haunted by two young girls that were murdered there. This is one of the most notorious haunts in Flagstaff. A girl killed herself in the dormitory many years ago before Christmas break and it seems she never left. Lights turn on and off, there are odors, and sightings of her apparition. It is said she also likes to pull blankets off people that stay on the floor she lived on. The sound of hands clapping is heard, doors open and close spontaneously, and lights are said to flicker on their own. In 1973, officers Buckely and Morey were killed in the cell block by inmates during a riot. Both officers were beaten and stabbed to death. On a number of occasions, when guards would lock all of the doors in the cell block, they would find doors open between inmate counts. A number of the officers also noticed cold spots and the sounds of doors opening and closing. Several officers noticed misty forms at the end of the cell block on numerous occasions. The cell block is located in the same prison as the Arizona Death House, which is also said to be haunted. It is said that the ghosts of condemned prisoners haunt the death house at the state prison in Florence. Several guards have reported hearing screams and other strange sounds. Examples of occurrences are strange noises, screaming, random cold spots, strange lights, and humming sounds. In the summer of 1998, someone was shot in the middle of the night down in the wash. The screams are most likely from the young girl who was killed there. Floor boards creak, and voices from unexplainable sources are heard. The top floor is said to be the most haunted area of the building. A workman is said to have fallen over the edge of the canyon while putting railings up in the 30's. In the evening, it is said you can see a black misty figure near the railings. A fairly loud scraping sound from an unidentified source has also been heard here, almost like the sound of shoveling. A female spirit has shown herself to visitors in the Cleopatra Room. The innkeepers have experienced this before. Built in 1890, this building had many uses, including being used as a funeral home. Noises in the hallways, items being moved and whispered voices are all common reports from this location. Every night around midnight, the doors and cabinets open and close by themselves, and black shadows are said to appear throughout the building. Also, there are reports of being woken up in the middle of the night to see an apparition of a girl. It is said that a woman walks from tree to tree. The story goes that she was raped and murdered at the park on Broadway and Power Road and her spirit has not been set free. She has been seen roaming the park between 11:15PM and about midnight. During World War II, the military used the base to train pilots. The building (which is now the VA hospital) on the far west side of the base was a hospital. Many people have reported a male ghost who haunts what used to be the new baby viewing area and the old operating room area. People also report voices in what used to be the old Officers Club there. There have been countless deaths and mishaps in the mines. There are stories about haunted tunnels and a cyanide plant that had an alarm go off. Some people died and everything in the building is supposedly exactly the way they had left it. Lunch boxes are still open and magazines are still on the page they were reading. Many guests and staff testify that it is not uncommon to hear whispering and laughter coming from room 15. There is also a Theater Room Museum on the second floor, where dust on the beds reveals the outlines of sleeping guests, leaving adjacent areas intact and undisturbed. A former chambermaid's ghost has also been sighted. This used to be a hospital for TB patients many of whom died. One of the ghosts is a nurse who contracted the disease and passed away there. There is another ghost there that dislikes things hung on the north wall of the main room. There used to be artwork hung on the wall. In the evening, when the caretaker left, it would be on the wall. In the morning, it would be set on the floor. The ghost at this location is thought to be that of a lawyer who checked himself in and then hung himself at night with his shoestrings. Sometimes he appears in his old room, or in the hall. Also, very sad negative energy could be felt in that room, and it would get very cold. The hospital is now closed. In the early 1990’s, when construction workers were building the auditorium for the high school, one of the workers fell off of a high beam and was killed instantly on impact. They say you can hear moans and cries of pain in the auditorium at night during closing time. The house of the first governor of Arizona can be found here. The house is haunted by his young daughter, who died of pneumonia long ago. People who have been there at night have experienced sudden coldness, the sight of things moving by themselves, and whispering voices. Built in the 1920s, the hotel is haunted by Leone Jensen, who killed herself there. The ghosts of children are heard, running up and down the stairs. It seems the hotel now occupies the site of the first elementary school in Phoenix. For years many people have seen the ghost of Angeline. She was a small girl, that rumor has it died in the 1800's from a plague, while traveling in a wagon train headed west. There have been several sightings of Angeline. There have also been experiences, such as tiny handprints on the outside windows of cars. She has even been sighted near the area a few miles from her grave in search of her mother. Her grave is the only grave in the direct area. It is fenced, has a headstone and a single tree, and is located near Lynx Lake and Diamond Valley, right outside of Prescott. Not to much is told about the hotel, but there is a lady that haunts it. Footsteps are heard in the halls and the feeling of being watched is everywhere. Also many orbs have been captured on film at this location. This restaurant is said to be haunted by a ghost named Charlie. Built in the 1880's, it was a stage stop, post office, and a brothel. The mountain range is reported to have paranormal activity throughout. Some examples are seeing strange lights, shadows, etc. There are Indian burial grounds scattered throughout, as well as a rumor of a hidden gold mine somewhere. Female singing and crowd voices and noises are heard. Shadows, unidentified spirits, and an apparition of a woman in white are seen. EVP of music can be detected, and objects relocate by themselves. This Bed and Breakfast was the home of a young man who committed suicide after the young lady he intended to marry, jilted him. The doorbell rings in the middle of the night, but no one is there. Guests have experienced knocking on the walls, and the faucet in the bathroom down the hall, turning itself off and on. Strange lights are said to be seen, and cold spots that move around. 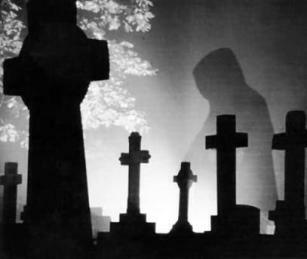 Reports of strange lights and ghost sightings in and around the cemetery. Many famous outlaws and citizens are buried there. The principal is said to have passed away in the school, and ever since then they have had many weird experiences. A brick fell out of a wall in the bathroom, doors unlock by themselves, and some people have even seen the female principal in the halls. Two spirits are known to haunt this theater. One is a woman wearing a long white dress from an earlier time. The man is thought to be a patron who died of a heart attack in the 1950’s. The woman has been seen frequently in the upper balcony seats, in an area that was once a balcony but is now sealed off. She is very protective over her space and has been known to push employees down the halls and stairs. The man seems to be the counter balance and helps anyone who has been injured by the woman. There are reports of feeling a hot breath on your neck, and batteries getting drained. The figure of a man is seen throughout the cave, as well as hearing singing and moaning near the miner's shaft. There is a young girl dressed in prairie clothes, wearing a white apron, that to wander the area of the old chicken coop and horse corral. It is thought she died from a fever. Laughing sounds have been heard in the area, and her apparition is said to appear near an old tree next to the ranch. One of the rooms in the hotel is haunted by a man who had a heart attack and died there. He has been seen looking out of the window and his shadowy figure has been seen walking the halls. Rebuilt after a fire killed occupants who were trapped on the top floor. It is said that the top floor is haunted by the spirits of those who died in the fire. Believed to be haunted by a woman that was murdered by her boyfriend, when he found out she was seeing another man in the hotel. Witnesses report seeing and hearing a ghost of a girl in the kitchen, and around the ballroom area. She seems to be crying or moaning for help. Several mine workers have reported seeing lights and workers that aren’t assigned to their level. One worker reported having another mine worker come into his line and help him work for over 30 minutes, only to find out later that there wasn't another worker on that level all day. A mine worker died in a cave-in when this mine was first being built, and it is said that the body could not be recovered, due to the size of the cave-in. One of the many classrooms in the vocational building has been condemned, because of rumors of a student killing himself there. The student now haunts the room. Students and teachers have reported hearing loud taps on the door, cold spots, and eerie footsteps when no one is around. There have been rumors of spirit visions in the male restrooms of the school. Sinks turn off and on, while toilets tend to flush constantly when no one else is in the room. Teachers have reported an adult male in the restroom that disappears in a split second. Screams and cries can be heard in this forest. Also, there have been reports of a demon-like creature with red eyes seen in the river, this is most likely just an urban legend however. At least three spirits have been seen by guests and employees of the Hotel Lee. One ghost is of a young teenage girl, usually seen late in the evening, carrying towels down the back hall. The other is believed to be the original owner of the hotel. She is seen walking the halls late at night, and has been known to knock on, or rattle the doors of the rooms. The third spirit is that of an Indian woman, believed to pre-date the hotel. She has been seen hovering above the guest’s beds, and is known to take small screwdrivers and awls, later to return them to odd places. There are two predominate places within the prison where the spirits are active. One is the dark cell and the other is the visitors' museum. The dark cell hosts a ghost that likes to pinch. There are supposedly two spirits in the visitors' museum. One is a woman who sings quite early in the morning, and the other is a poltergeist that likes to play with money.